It is thought that angora goats originated in the Himalaya Mountains of Asia. They found their way to Turkey where the name Angora was derived from Ankara, the region's capital. Angoras and their fleeces are mentioned in the cunieform tablets of sumeria, and in the Bible. Angoras were jealously protected from exportation until the nineteenth century. The angora goat's history in the United States traces back to 1849, when seven does and two bucks were given to Dr. James Davis of Columbia, South Carolina by the Sultan of Turkey. By the early 1860s, angora flocks could be found through the South and Southwest. After the Civil War, the largest flocks could be found in Texas and California.The angoras proved adaptable to a wide range of conditions, but they seemed most at home in the central and southwestern region of Texas, where ranges were large. Mature bucks weigh 125-175 pounds and mature does 80-120 pounds. The mohair grown by angora goats is considered a luxury fiber, and grows at the rate of one inch per month--shorn twice a year. Our white and colored angora goats are raised in our small herd with daily individual attention - goats that are well cared for, will be easy to handle, and do routine veterinarian work with. 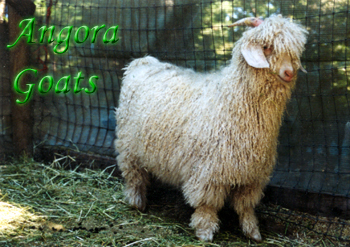 Our angora goats are bred for excellence - our herd includes top show quality animals. Our goats have won numerous honors, including California State Fair, the Black Sheep Gathering, The California Wool & Fiber Festival in Boonville, and the Estes Park Wool Market. 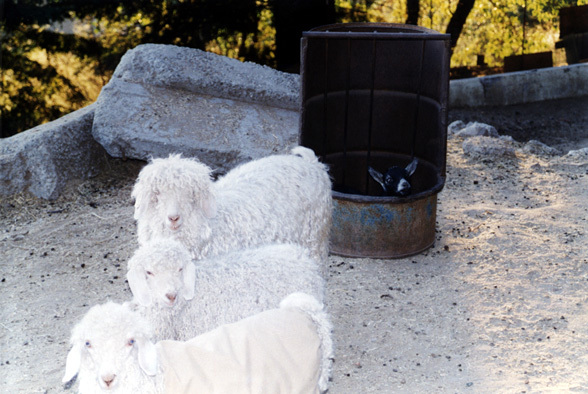 Our angora goats produce the finest fleeces, and have also won numurous awards and honors at California State Fair, Black Sheep Gathering, and the Monterey County Fair. Wool processors have compared our adult mohair to kid quality. Just imagine what our kid fleeces are like! Visit the Menagerie and see our great spring kids! Fine mohair is available as raw fleeces or processed into batting, rover or sliver. Click here for more information.